This picture is the view of the cross section of a wire carrying an electrical current, including its surrounding electromagnetic field. 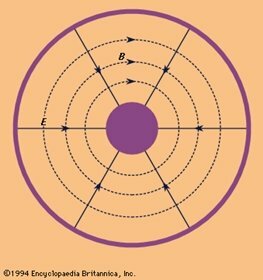 The purple center is the current carrying wire itself, and the dotted lines around the outside show the naturally occurring electromagnetic field that rotates around the wire. The ring nearest the wire, or the innermost dotted line, carries the strongest field, while the purple ring furthest away from the center indicates where the field fades to almost zero. This field is in constant motion, rotating around the outside of the wire. The rotational direction of the EMF depends on which direction the current is traveling. Using this picture as an example, if the current were traveling away from you (or into the screen), the EMF rotation is clockwise, and vice versa. The distance from the center of the wire to that zero EMF ring depends on the strength of the current traveling through the wire. So there’s an electromagnetic field surrounding wires….how is that dangerous? When we plug in our laptops, the electricity we use from our walls is alternating current. That is, the direction of the current in the wire changes back and forth, and therefore, the EMF rotation goes from clockwise to counterclockwise, back to clockwise, and so on. This back and forth motion creates a vibration in the tissues of the body that are within reach of the EMF. Heat is an inherent byproduct of the use of any electrical device. This temperature increase from the laptop has been shown to dramatically affect reproductive ability, especially in males. The temperature generation is especially of concern, due to the temperature sensitive conditions of fertility and conception in both males and females. More information about the temperature sensitivity of fertility can be found here. The second concern to researchers is mutation. In laboratory studies, cells have been observed to mutate under constant vibration situations. Cancer is simply a cell mutating from a healthy cell into a cancerous cell, though the specific cause for this mutation is yet undetermined, and EMF has long been a topic of suspicion. Cellular mutation is discussed here.